Antibes was originally a Greek town by the name of Antipolis, situated on the edge of the Baie des Anges. The name literally means on the opposite side of the bay to Nice. Today, the image of the two opposing towns is not just geographical. Whereas Nice is known for its aging population, Antibes is considered incredibly young and trendy. Next to the town is Cap d'Antibes and Juan-Les-Pins. Together they have a population of 73,000 and form a popular destination for both Parisian and international tourists. The Greeks came here to settle around 4 BC, but were later driven out by the Romans. After the collapse of their empire, the Grimaldi family took over the ownership. Due to its proximity to the small nation of Savoy, the town was given heavy fortifications around the 17th and 18th Centuries. In the late 19th Century, however, the focus was switched to accommodating the growing number of people seeking a home here. As a result, the town's defences were pulled down and Antibes was allowed to expand. You don't get more stereotypically Mediterranean than Antibes. A port packed with luxurious yachts is found alongside a secluded sandy beach. 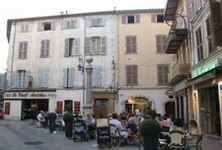 In the town, daily life usually revolves around the busy marketplace in the centre with its narrow cobbled streets leading away to the rest of Antibes. The town is always decorated with flowers. If you want to find some of the best beaches on the Cote d'Azur, head to nearby Juan-Les-Pins. The local inhabitants usually go here for the nightlife as well. If that doesn't interest you then at least you can rest assured that most night time activities are situated away from the actual town leaving it peaceful for everyone else. A large number of artists have arrived in the town over the centuries to make their home here. The most prominent ones were Max Ernst, Nicolas de Stael and Picasso. The latter has his own museum located within the impressive Chateau Grimaldi, which he used as a studio for 6 months while he was in the area. The castle itself is a glorious feat of construction with fine views out over the sea. The Antibes area comes second only to Monaco in the most expensive places to buy property on the Cote d'Azur. The Cap d'Antibes, located among secluded woodland, has properties at the upper end of the price range. Cheaper properties are to be found further inland. Do you know Antibes better than we do? Do you have photos of Antibes? Halfway along the coast towards Italy in the Alpes Maritimes (department 6). Economy: Tourism is a big industry for the town. Interesting fact: Picasso made his home here and used the castle as his studio.